Tarzán López was born Carlos López Tovar on August 28, 1912 in Jerez, Zacatecas. He was an amateur boxer, but was so impressed by the "new" sport of lucha libre that switched jobs, making his pro debut on April 12, 1934 as Carlos Lopez, beating Enrique Gonzalez in the semi main of a card at Arena Peralvillo-Cozumel, in Mexico City's district of Tepito. López had also tried swimming before. Two months after starting up the company had a show in Guadalajara, he was hooked and asked the wrestlers how he could get in. He was told to move to DF, where he met Diablo Velazco, and was his first star student. He made a name for himself working at the minor arenas of the Lutteroth circuit, back when the Lutteroths had close a complete 100% monopoly of wrestling in the country. He stood out as a hot enough young prospect to start getting shots in the first matches at the Arena Nacional, the main building in Mexico for wrestling at the time, that held 3,500. Back then he gained the "Tarzan" nickname, given to him by the fans because of his very athletic build. Had his first major feud against Salvador Flores, nicknamed "Hercules del Ring" because of his strong looking appearance. Carlos showed his tremendous ability in the ring, getting the magazines and the real sports papers to rave about him being a "future legend", which made him move up to the main events. Had his first major belt on March 11, 36 beating Mario Nuñez to become the second ever National Welterweight champ. By this point, Lopez was the premiere worker in the country, and legend puts him as the most feared shooter in the Mexican business at the time. He was not one to take liberties in the ring, or unprofessional in the slightest, but he was somebody nobody ever confronted because of his reputation as an amateur and as a submission wrestler. In 1937, his matches with "El Maestro" Raul Romero had the fans and the media raving about the level of wrestling in the country. He lost the Welter belt to Bobby Bonales on March 1939, exclusively because he was moving up to the middleweight ranks. Lopez also was the successor of Octavio Gaona, the famed first Mexican world champion ever, by taking the NWA Welter title off him on 02/19/40. During his career, he'd hold that title a total four times. This was the leading Mexican belt at the time, both because the middle was the premiere division and because at the time was the only world championship in the country. While this became a National Wrestling Alliance title in the 50s, it was at the time affiliated with the old National Wrestling Association, the leading organization in the US at the time, which recognized Bronko Nagurski as heavyweight champ. The NWA welter title debuted to Mexico a few years later and the light heavyweight one was an American based belt that didn't come to Mexico until the late 50s. Lopez dropped the belt to Miguel Black Guzman (who became the top babyface for a long time in Texas and the first Mexican superstar in the US). The title change was because Lopez asked for a vacation for a few weeks for Christmas and New Year's, and he regained it Feb 11 42 in DF, and held it for four years. At this time Lutteroth was running 7 nights a week in DF, usually 400-500 small gyms but he sold out frequently especially on Fridays. He also promoted boxing and owned a baseball team and saw wrestling as a growing industry. He built his own set of medium-sized identical round arenas that would hold 5,500 called Arena Coliseo. The first one was in DF and he later built ones in Guadalajara and Acapulco. By owning his arenas he had a huge edge in many promotional wars later in life and was able to cut a lot of costs during periods where business was down. Year later he also was able to rent out some of those arenas for events such as Disney on Ice and the like. In 1940 Lopez was voted MVP by the media, and not only was the best worker, but also the biggest draw in the country. He'd have those honours again in 1944 and 1948. Historically, this award would be given to the best worker/draw/champion combo in the country. Considering everything in wrestling is political, this award usually was quite fair. On September 1942, Tarzan Lopez defended his NWA belt in a famous match against Harry Fields that Box y Lucha's popular poll had as "best match of the 40s". On April 2, 1943, he still was the biggest star in the country and headlined the first show ever at EMLL's new lucha building, La Arena Coliseo. His opponent was a young rising rudo star, that was just going through every major star, and was put in a final test against the number one in the country. Lopez won in two straight falls, but the loser came out a winner in respect by hanging out with the champion. Tarzan's opponent that night was El Santo. This bout was considered a rematch of a win that Santo and Charro Aguayo had had over the team of Tarzan Lopez and Firpo Segura. After the match, Santo said that he'd just lost against an unbeatable wrestler, and that there was no shame in losing against the best in the business. Years later, Santo had the following to say about him: "He wasn't just the best, he was the most popular as well. He was like a God to the fans. He wasn't very tall, but he was wide and very well built. Very strong man, but also very agile. [...] His move set was incredible. He mastered all the classic holds. In the mat he really was almost unbeatable. He always was very graceful. [...] He also knew the right holds to finish his opponents: the best and most painful ones. He even invented a few ones, like "el nudo". Without a doubt he was a prodigy of a wrestler, and he probably was the toughest opponent I ever faced during my career". Other of Lopez' famous matches against Santo were on January 10, 1944 (Lopez def. Santo in a title defense) and on Feb 23, 1945 when the Atomic Pair of Santo and Gory Guerrero defeated Lopez and Jack O'Brien. Both of these matches sold out Arena Coliseo. When on Feb 23, 1946, Gory Guerrero defeated Lopez for the NWA Welterweight title at Arena Coliseo, Guerrero got the label of "consagrado", which basically means that once you reach this status you will be a superstar forever. Had a publication like WON, and the equivalent of tape traders existed back then, considering the reputation of the match, it would have probably been a MOTY or a very strong candidate. In 1949, after a long build up, Tarzan Lopez defeated Mike Kelly (billed as being from Ukraine) with his famous nudo, on the main event of the 16th Anniversary Show. This was a textbook title chase angle, as Kelly had beaten Guerrero a year before for the NWA Welter title. The angle was that Kelly was going to leave Mexico to defend the belt around the world, but that the company put a huge money sum on the table to get him to defend against somebody, and the company chose Lopez. This match got MOTY honours in the year end company polls. In that match he debuted a new submission move called "el nudo" that he came up with and later in the 80s became famous as the Signo Special, and it's currently Satanico's finisher. 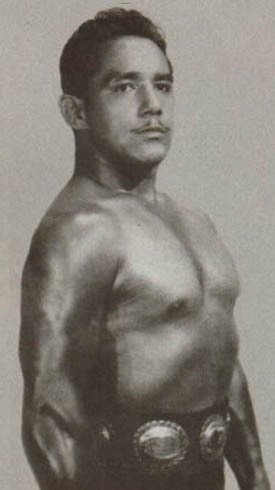 During the late 40s he teamed very often with best friend Enrique Llanes (whose sister is Eddy Guerrero's mother). As the history goes, Llanes, who was an athletic amateur wrestler that wanted to get into lucha libre, offered him a deal. He'd get lucha lessons in exchange for locksmith training (which was Llanes' job). Lopez accepted, and Llanes turned out to be a great worker with a reputation as a very fine technician, as well as Lopez' most famous tag team partner in "La Pareja Ideal". A famous pun at the time was that Lopez and Llanes were the masters of both "llaves", being that a single word that can mean either (wrestling) hold, or key. Lopez' last major title win was on Sept 9, 56 after winning the vacant National Light Heavyweight Title. That run was unplanned as whoever was going to win did not show up and he no showed. This belt was vacated when his tag partner Llanes was stripped of it. He vacated the title himself in early 57 when his career ended. The way Tarzán López left the wrestling business was a very sad one. Once, in the late 50s, he went to the EMLL office and asked Güero Flores (probably the man that paid the wrestlers) for some extra money because a person very close to him got very ill and needed expensive medicines. Carlos said he was okay with getting that amount discounted of his monthly payoff. Flores refused to give Carlos that money stating that "la empresa isn't a bank or a pawn house". The Lutteroths, knowing they had the monopoly of national lucha libre, were popular for being very ungrateful to their wrestlers, even the big stars. Back in the day, Carlos' case was the most popular and notable one, but if one of their original money draws was treated that way, we can only guess about the mid and low card talent. Back then the promoter was Salvador "Chavo" Lutteroth Jr. who had taken over from his dad. Chavo was legendary as being tight with money and that's one of the reasons why major wrestlers like Santo, Demon, Mascaras, Tiniblas became free agents as soon as they could, and everybody else was quick to join up when opposition groups formed. very bitter one and declined to give any interviews to the lucha magazines even many years after his retirement. He invested well the money he earned during his wrestling years, as he owned a successful chain of locksmith shops. He lived a good life after that, but rarely ever even talked privately about lucha, even though he kept in touch with some of his friends like Llanes. He'd also done a few TV comedy appearances over the years. Lopez died on August 28, 1975, which was his 63th birthday, after suffering from cancer, and was buried at the Panteón Español (Spanish Pantheon) in Zacatecas. This page was last edited on 14 May 2016, at 16:55.